The big day is fast approaching! We know what we’ll be eating this Valentine’s Day, do you? If you haven’t secured a coveted spot at that trendy romantic restaurant (or one of our couples cooking classes), you may feel a slight tightening in your chest. Put down that stress ball, breathe, and check out this delicious risotto recipe. You’ll impress your date with your culinary prowess AND discover how easy it is to create a gourmet meal at home! Serve this dreamy creamy risotto with a light dish like poached prawns or chicken breast. OR… Go big with hearty skirt steak, balsamic marinated or spiced. Finally, don’t forget a sweet finale! 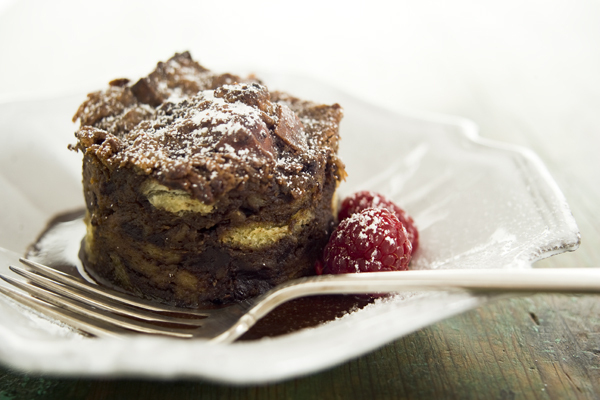 This can be as simple as strawberries and chocolate, or as decadent as this Mexican Chocolate Bread Pudding. Basically, you have options. Other great side dishes can be found in our recipe library. 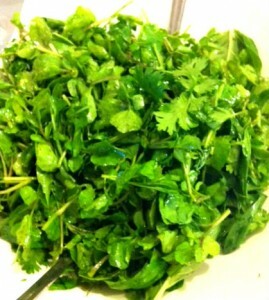 Prepare Kale Puree and Broth: Bring water up to a boil in a large sauce pan or pot. Add 1 teaspoon of salt, pepper and sliced garlic. Roughly chop the rinsed kale, stems and all, into small pieces. Blanch the kale in the water for about 7 minutes or until the stems are very tender. 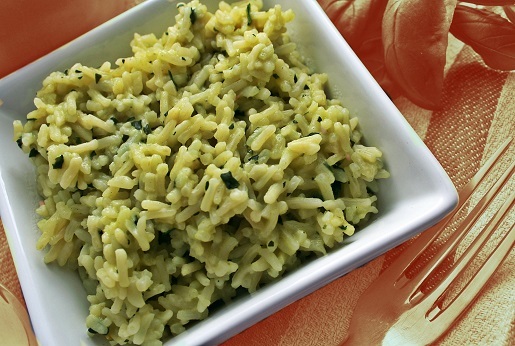 Remove the kale and garlic with a spider (not the scary kind) and place into the jar of a blender. Add 1/4 cup of the cooking water to the blender and puree until the kale is very smooth. Save the broth in the pot and keep it hot. Set the puree aside until the end. Sauté the Onion: Add the olive oil to a Dutch oven or large sauce pan set over medium heat. When shimmering, add the onion and 1 teaspoon of salt and cook, stirring frequently with a wooden spoon, until softened, about 3 minutes. Cook the Rice: Add the rice and cook, stirring until the rice is coated with olive oil and looks chalky, about 3 minutes. Add the white wine and simmer until the wine is absorbed (Note: it happens very quickly). When the wine is absorbed, add enough broth to just cover the rice, about ¾-1 cup depending on size of pan, bring back to a simmer and stir frequently until the rice has absorbed most of the broth, about 2 minutes. Repeat this process, stirring frequently between additions, until the risotto is done. It is done when the rice grains are just tender but still have a bite, like al dente pasta, about 15-20 minutes. Not when the broth is gone. You must taste a grain often. You will have extra broth. Hold onto it and keep it warm. You may have to use it again before serving the risotto. 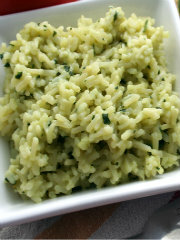 “Spin” the Risotto: When the rice is ready, turn off the flame and add the butter and Parmigiano cheese. Stir aggressively or “spin” the risotto to really make it creamy. Add the kale puree and continue to mix until thoroughly combined. Taste and re-season with more butter, Parmigiano cheese or salt. The risotto should be loose and a little soupy, not tight and clumpy. Plate the Risotto: Lay out the first course bowls on to the work surface. Check the risotto. If it has tightened up at all, add some of the hot broth to loosen it up a bit. Spoon a 1/2 cup of risotto into each bowl. Top with a little crumbled goat cheese and a grate of fresh nutmeg. Wipe the rims clean and serve. Last week, the ladies of Parties That Cook gathered around the office’s kitchen table (you better believe we have a kitchen in our office!) for August’s Cookbook Club. It had been a while since our last lunch, having skipped July’s Cookbook Club, and it was clear we were all excited to bring it back. This month it was Erin’s turn to determine our fate select the featured cookbook. 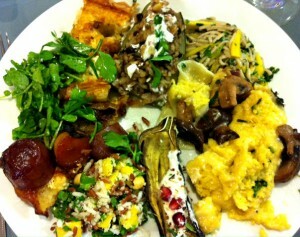 She went with Plenty by Yotam Ottolenghi (of London). This book provides large, beautiful photos of the completed recipes. They’re quite inspiring. Prime example: Beth got ahold of the cookbook early on. She not only found it a difficult to pick a recipe, but ended up tagging the book with so many post-its you would have thought it was her go-to cookbook! I’m pretty sure she ended up buying the book for herself. 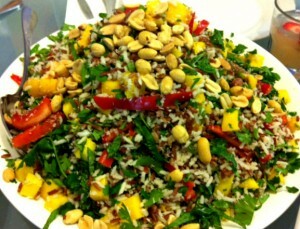 Mango and Coconut Rice Salad – Talk about a gorgeous menu item! Heather selected this crisp, refreshing salad – a great option for those with dietary restrictions celebrations. Heather was pretty pleased with her salad, though she did wish there was a bit more flavor to the rice. 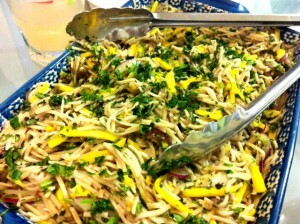 Soba Noodles with Eggplant and Mango – Roxanne brought in this delicious dish, and let me just say: YUM. These cold noodles cook very quickly! And though she removed them from boiling water before the recipe had advised, Roxanne still thought they were overcooked. Nonetheless, everyone loved the light, mild citrus flavor of this salad. I enjoyed the leftovers all week! 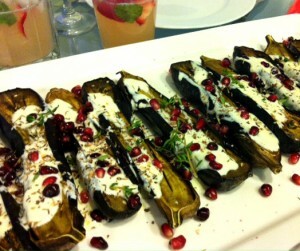 Eggplant with Buttermilk – Michelene went with the cover recipe – a beautiful, simple dish we all welcomed onto our plates. Michelene said she could see herself making this recipe again for her next get-together. Stuffed Zucchini – Crissy, also impressed with the amazing photography in the book, claimed the Stuffed Zucchini for this cookbook club. The results: DELICIOUS. 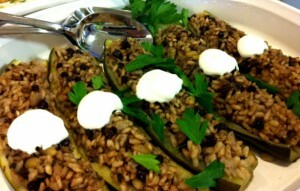 On a normal day, one stuffed zucchini could probably serve as lunch in itself. On a cookbook club day, however, we feast! 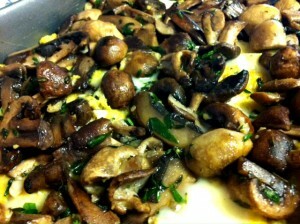 Mushroom and Herb Polenta – As usual, Rebecca was one of the last to pick her recipe, but this time, it proved worth the wait! This buttery, cheesy side tastes best hot out of the broiler. And while I’m sure one could easily eat a heaping helping of this polenta for lunch or dinner, I’d definitely recommend a light salad to offset the rich flavors of this dish. 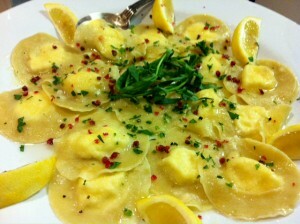 Lemon and Goat Cheese Ravioli – Rosie elected to make fresh ravioli, vowing to put her pasta maker to use. Mission. Accomplished. Though they lost some of their heat waiting for certain slow pokes to get their contributions to the table, these giant raviolis were so tasty! I don’t think ONE single ravioli made it to the fridge. 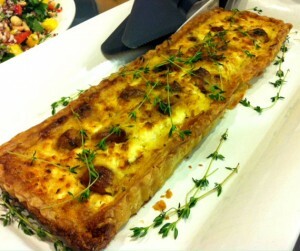 Caramelized Garlic Tart – Bibby selected her dish early on, and boy did she choose wisely! This fantastic tart had a great, crumbly crust (thank you, puff pastry! ), and you really can’t go wrong with goat cheese. 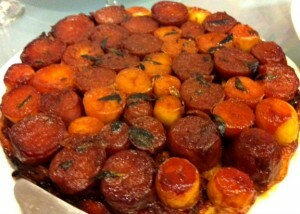 Perhaps this dish really did live up to it’s hype as the “most delicious recipe in the world,” but I’ll let you decide. Surprise Tatin – Erin took the cake (pun intended, as we quickly learned this book did not offer dessert recipes!) with the Surprise Tatin. What’s so surprising, you ask? Would you be surprised if I told you those were potatoes layered across the top of that puff pastry tart? BAM! This tart was also quite delicious (another victim of wonderful goat cheese). Christina was unable to cook for this cookbook club, as she hosted a huge summer bash the day before. Luckily for us, she decided to contribute a simple, delicious (addictive) drink instead! Lemonade + Strawberries + Mint + a dash of Sparkling Water is really the only way to go on a warm summer day. Mmmm! Notice anything missing from this lunch? (Besides mention of Laura, Kelle or Tanya, each of whom were unfortunately unavailable.) How about MEAT?! That’s right, Plenty is a vegetarian cookbook. And you know, we didn’t miss the usual meaty centerpiece at the table this time. Together, our dishes brought a wholeness to the meal, proving that you don’t need meat to have a truly satisfying lunch/dinner/party. We had PLENTY.